Getting around the menus in Cartoon Network Racing is pretty easy. Multiplayer is the "Versus" option on the main menu (good) and Single-Card Download is the "Versus Dash" option in the Versus menu (not as good, because it doesn't indicate that that's the Single-Card Download multiplayer, but it's an excusable oversight). The opening credits are a little long. Download time is average (not bad). The menus are very responsive. The accessable areas are large. The buffer zones in between the menu options are sufficient. No problems here. The driving system is good. It's not great, but it's good. Most of the game is successfully responsive and the carts do exactly what you expect them to do (based on the buttons you've pressed). There's only one glaring error. In what I can only guess was an attempt to make kart collisions more realistic, almost all collisions with stationary objects (walls, poles, etc.) will cause your kart to instantly stop dead. Hit a wall and get stopped dead? OK. Barely brush a wall next to you as you're passing by and get stopped dead? Frustrating and dissuading. Part of the reason to put Single-Card Download into a game pack (as opposed to Multi-Card Play) is to get people without the game to try it out, hopefully like it, and hopefully like it enough to buy it. While yes, this problem can be overcome in time by game owners who are patient and work at it, playing it in Single-Card Download before buying it doesn't make it easy to be successful, increasing the desire to own it. Add to that that the target audience - kids - is not an extremely patient audience (on average). Cartoon Network Racing looks good. It's not great - I've seen better 2D and better 3D - but better than I expected. The sound is actually pretty helpful: the sound effects set the mood and some of the voice acting (right from the shows for a few characters) is impressive (for however little of it there is). There aren't that many features. There are only six racers and one course in the Single-Card Download, but the Single-Card Download is meant as an enticement to buy it, not just to keep playing it via download. While other games allow for mini games instead of the big picture, Cartoon Network Racing gives you a full-out race. Y'know, playing a licensed title is usually a bit of a downer. Most of the time, companies phone the project in. It can be anywhere from slapping a face on a project that didn't fly on its own to putting together a new project without too much effort. On a rare occasion, though, the opposite will happen - a good game will get a licensed face or a developer will really care to make it a great game because they have a great deal of self-respect. Cartoon Network Racing is not a great game, but it is a good game and I believe it to be closer to the latter possibility, just not quite there yet. There are a lot of really enticing aspects to it, but it seems like it was rushed a little at the end. The game, like all other kart racing games, wanted to be the next Mario Kart DS, but it fell short (just like EVERY other kart racing game since). I don't blame it for falling short: Mario Kart DS set an extremely high bar for kart racing. Of the closest kart-only followers, Cartoon Network Racing is definitely one of the closer runners-up I've played so far. Indicate the "Versus Dash" is the Single-Card Download option within the menu option. Shorten the opening credits, or make them skipable. Repair the collision aspects of the racing. Allow the host to choose from any racer they've unlocked in the single-player game. 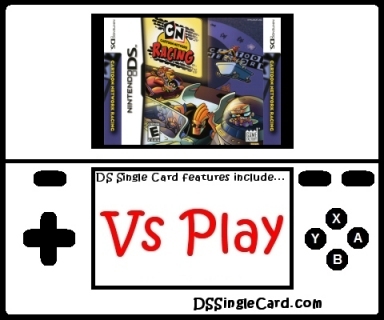 Click here to return to the DSSingleCard.com Cartoon Network Racing profile.